Domitian, Roman emperor AD 81 to 96, the second son of the emperor Vespasian and Flavia Domitilla, twelfth of the Caesars, and third of the Flavian dynasty, was born at Rome on the 24th of October AD 51. When Vespasian was proclaimed emperor at Alexandria, Domitian escaped with difficulty from the temple of the Capitol, which had been set on fire by the Vitellians, and remained in hiding until his father's party proved victorious. After the fall of Vitellius he was saluted as Caesar, or prince imperial, by the troops, obtained the city praetorship, and was entrusted with the administration of Italy until his father's return from the East. But although in his father's lifetime he several times filled the office of consul, and after his death was nominally the partner in the empire with his brother Titus, he never took any part in public business, but lived in great retirement, devoting himself to a life of pleasure and of literary pursuits until he succeeded to the throne. The death of Titus, if not hastened by foul means, was at least eagerly welcomed by his brother. Domitian's succession (on the 13th of September 81) was unquestioned, and it would seem that he had intended, so far as his weak volition and mean abilities would allow, to govern well. Like Caesar Augustus, he attempted a reformation of morals and religion. As chief pontiff he inquired rigorously into the character of the vestal virgins, three of whom were buried alive; he enforced the laws against adultery, mutilation, and the grosser forms of immorality, and forbade the public acting of mimes. He erected many temples and public buildings (amongst them the Odeum, a kind of theater for musical performances) and restored the temple of the Capitol. He passed many sumptuary laws, and issued an edict forbidding the over-cultivation of vines to the neglect of corn-growing. Finally, he took a personal share in the administration of justice at Rome, checked the activity of the informers (delatores), and exercised a jealous supervision over the governors of provinces. Such public virtues at first counterbalanced his private vices in the eyes of the people. Domitian was the first emperor who arrogated divine honors in his lifetime, and caused himself to be styled Our Lord and God in public documents. Doubtless in the poems of writers like Martial this deification was nothing but fulsome flattery, but in the case of the provincials it was a sincere tribute to the impersonation of the Roman Empire, as the administrator of good government and the peacemaker of the world. Even when Rome and Italy smarted beneath his proscriptions and extortions, the provinces were undisturbed. 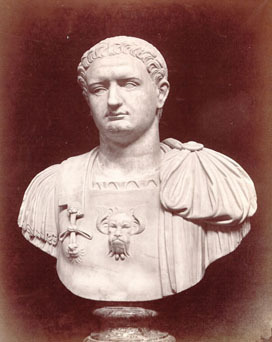 Though he took the title of imperator more than twenty times, and enjoyed at least one triumph, Domitian's military achievements were insignificant. He defeated the Chatti, annexed the district of the Taunus, and established the Limes as a line of defense; but he suffered defeats at the hands of the Quadi, Sarmatae and Marcomanni; in Dacia he received a severe check, and was obliged to purchase peace (90) from Decebalus by the payment of a large sum of money and by guaranteeing a yearly tribute -- the first instance in Roman history. His jealousy was provoked by the successes of Agricola in Britain, who was recalled to Rome (85) in the midst of his conquests, condemned to retirement, and perhaps removed by poison. The revolt of Antonius Saturninus, the commander of the Roman forces in upper Germany (88 or 89), marks the turning-point in his reign. It was speedily crushed; but from that moment Domitian's character changed. He got rid of all whom he disliked on the charge of having taken part in the conspiracy, and no man of eminence was safe against him. He was in constant fear of assassination and distrusted all around him. During the last three years of his life his behavior was that of a madman. He sentenced to death his own cousin and nephew by marriage, Flavius Clemens, whose wife he banished for her supposed leaning towards Judaism (Christianity). A conspiracy among his own freedmen -- set on foot, it is said, by his wife Domitia Longina, who knew her own life to be threatened -- cut short his career. He was stabbed in his bedroom by a freedman of Clemens named Stephanus on the 18th of September 96.